SIS Digital Media Limited - news release: Digital Out of Home is getting 'Mega' in Manchester! Digital Out of Home is getting 'Mega' in Manchester! The DOOH roadside sector is expanding faster than any other part of the Out Of Home industry, as everyone from SME's to global multinationals recognise the incredible communication opportunities available with new networks outside of London. Early April saw the design, build and installation of a roadside Mega 6 LED billboard for one of our group companies, 8 Outdoor. 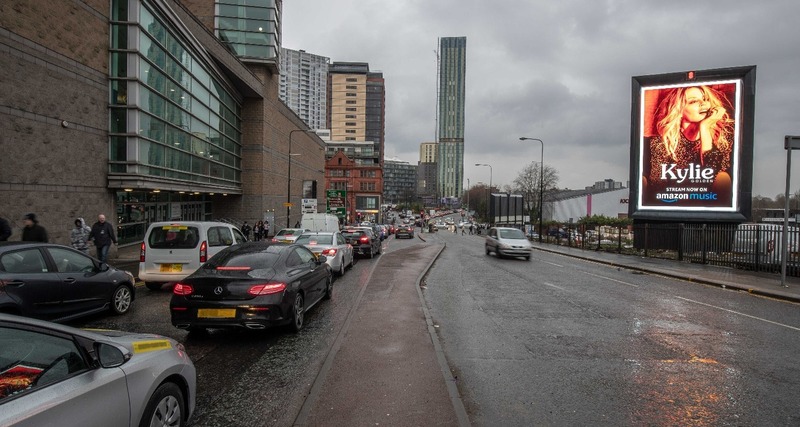 The LED billboard is located inbound on the A6042, a major arterial route into the centre of Manchester. Our large format Mega 6 LED billboards for 8 Outdoor measure 7.5m x 5m and consist of 228 of our marketdefining ecofriendly and superlightweight D10 LED panels. This site goes alongside six D48’s and another two large format LED billboards all designed, built and installed for 8 Outdoor by SIS Digital in the Manchester and Greater Manchester area. For more information about our work in Manchester and the surrounding area, please contact info@sisdigital.co.uk.